Minneapolis-based Dayton’s was among the nation’s leading department stores for nearly a century. 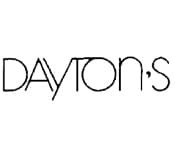 Founded in 1902 by George Draper Dayton, Dayton stores quickly became synonymous with quality merchandise, superior service, fashion leadership, and community involvement. In 1969, the Detroit-based J.L. Hudson Company merged with the Dayton Corporation to form the Dayton-Hudson Corporation, adding 21 Michigan-based stores to the total. In 1990, the department store division of Dayton-Hudson (now Target Corporation) acquired Chicago-based Marshall Field’s. Both Dayton’s and Hudson’s retained their individual store names until 2001 when they were united under the Marshall Field’s namplate. Prior to changing its name to Marshall Field’s, Dayton’s stores numbered 19, serving communities throughout the upper Midwest.